I know what you’re probably thinking . . . isn’t the Spring Showcase over? 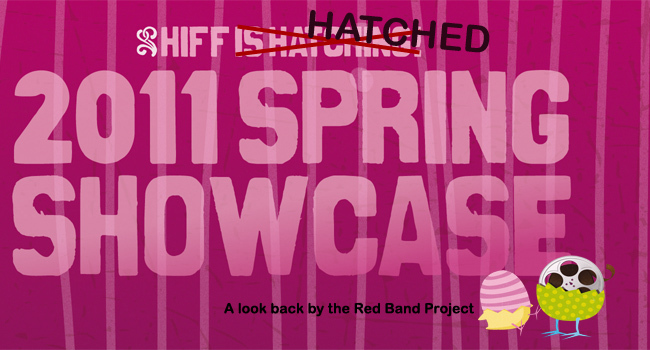 Ok yes, HIFF’s 2011 Spring Showcase did finish last week (hence the “HIFF Hatched” graphic). However, due to a very busy schedule there was no HIFF Spring Showcase preview nor were there posts during the showcase. Don’t worry though, I’m still going to talk about my experience this past week at the showcase. Though it probably won’t be as in depth or detailed as the fall festival posts, it’s still stuff that happened to me this past week. So without further ado, let’s take a look back at the week that was . 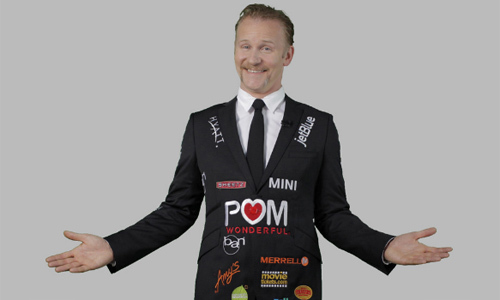 . .
Boundary-pushing Oscar®-nominated filmmaker Morgan Spurlock explores the world of product placement, marketing and advertising in POM Wonderful Presents: The Greatest Movie Ever Sold, a film that was fully financed through product placement from various brands, all of which are integrated transparently into the film. With humor and insight, POM Wonderful Presents: The Greatest Movie Ever Sold unmasks the marketing process to bring audiences behind closed doors directly into the pitch meetings and marketing presentations which ultimately inform our everyday entertainment decisions. Ever since working for UH Sports Marketing back in 2004, I now have a greater understanding on the practical applications of marketing–more specifically, marketing that is actually being implemented out in the field. I first heard about this film in early January when it got selected to be in the Sundance Film Festival and eventually was picked up for distribution by Sony Pictures Classics (so yes, I’ll be able to see it later this month). A marketing documentary about marketing in movies . . . yes, there’s a certain META quality to it, but the film plays to two things I’m into: movies & marketing. As the government-appointed protector of our cinematic legacy, the National Film Registry selects culturally, historically, or aesthetically significant works for preservation in the Library of Congress. From award-winning features to music videos, experimental films to home movies, each Registry selection reflects a truth of its time or a standout artistic vision. Guided by a true cinephile’s love of the medium and a treasure trove of archival footage, the film molds a cultural history from pieces of film, offering a microcosm of the work of the National Film Registry and making a powerful case for film preservation. Again, another film that I heard about because it played at Sundance. Being into movies as much as I am, anytime there’s more to find out about cinema I’m pretty much game for it. While initially the topic of film preservation may not sound that exciting or enticing, I’m sure there have to be some “amazing” stories behind the preservation of film. I mean, we’ve all heard a story here or there about how when they dug out the old reels to show it again it needed to be heavily restored due to degradation. Why not find out a little bit more about preserving pop culture from people that are passionate about it? Rachel Weisz turns in a stellar performance as Nebraska police officer-turned-peacekeeper Kathryn Bolkovac in this tough-minded thriller set in Bosnia at the turn of this century. Based on a true story, Larysa Kondracki’s gritty debut follows Bolkovac as she exits her tangled personal life back home in favor of a job with the U.N. peacekeeping force in the still-tense former Yugoslavia. Once there and working for the U.N.’s Gender Office (headed by Vanessa Redgrave in a superb cameo), which investigates sexual assaults, Bolkovac uncovers evidence of human trafficking and sexual slavery that implicates fellow peacekeepers and officials, evidence that puts her life in danger. I’m not going to lie, the main thing that got me interested in this movie was the fact that there are known actors in it (Rachel Weisz, Monica Bellucci, and David Strathairn). After that though, I did read the synopsis a bit and it did intrigue me. While I read it had lukewarm reviews during last year’s Toronto International Film Festival, everyone I heard from at this year’s showcase that saw it seemed to have enjoyed it. It did eventually find an American distributor, so we should be seeing it in theaters later this summer. So what do I do after I come back from vacation? Take it easy perhaps? No, of course not! I just right back into a busy schedule with working a UH baseball game, screening Soul Surfer and follow that up by working the opening night of the Spring Showcase. Knowing that my evenings were going to be very precious for the next two weeks when I got back from my vacation, I only budgeted two nights for working the showcase, opening Friday and the following Monday. Long story short, I had one free night for myself during the entire showcase and I wasn’t about to give that up. Originally I had planned to work Monday night at HIFF. Well that didn’t exactly happen. I wake up Monday morning and find an email from a mainland Warner Bros representative asking if I could screen Arthur for them . . . THAT NIGHT. Since Warner Bros isn’t a studio I regularly run screenings for, I jumped at the opportunity. So sadly, Friday night turned out to be the only night I was able to work HIFF. What’s funny though is that I ended up being at Dole more for work than I did volunteering. 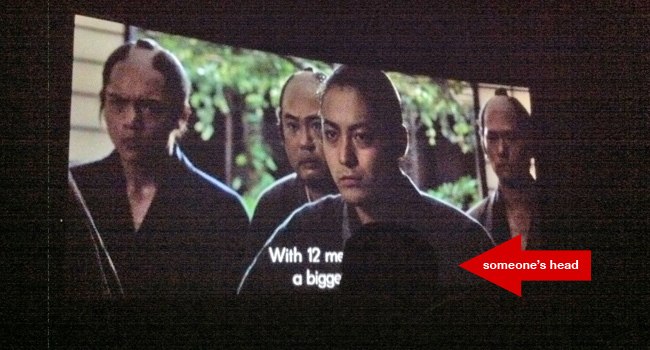 So on that opening Friday, I did manage to see a good portion of 13 Assassins since we had a lot of down time between films for theater ops. Walking in a good halfway through the film I pretty much got the gist of the plot. From what I gathered, it was your classic ‘struggle against a tyrant’ scenario where a smaller force (the 13 assassins) is opposing the person in charge. 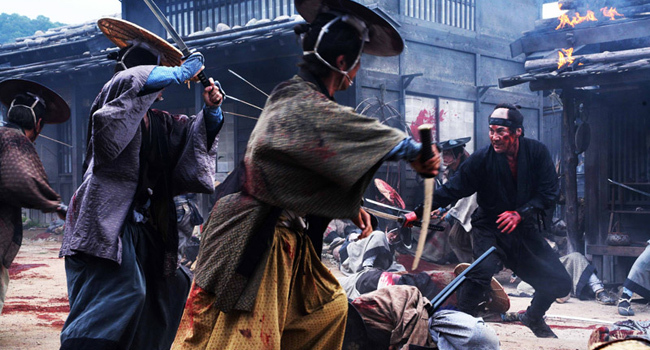 It was going fairly well when towards the end of the film (the point at which the 13 Assassins execute their grand plan) the movie kicked it into awesomeness territory with a great set of fight sequences. Sadly though, I didn’t get to see the climatic finish (there just had to be one right?) as we had to check back in for duty before the film ended. However, one moment that did stand out to me in the film was when someone came and stood right in front of me blocking my view. Now since I was volunteering, unless there’s open seats in the theater (which there weren’t) you generally have to stand on the side against the wall in the area where the hall opens up to the rest of the theater. There were a bunch of us volunteers there standing and watching the film for a good while. Then out of nowhere someone else comes in and stands against wall opposite us–blocking my view of the screen’s subtitles. At first I don’t mind too much cause I thought maybe this person was trying to survey the theater to find an open seat. Nope. He just stood right there to watch the show. Yeah, I don't usually condone the use of cell phones during the film, but I had to make an exception this one time. Because of where I was, he was in a perfect position to obstruct my sight line . . . thanks dude. Since there were a bunch of us volunteers against the wall I didn’t have too much room to maneuver so I had to get closer to the dude to my left so that I could see around the obstruction. Producer David Brookwell, producer Ricardo Galindez, actress Arlene Newman-Van Asperen, actress Sonya Balmores, producer Roy Tijoe, and Noah Hamilton at the HIFF Spring Showcase. Sunday I was at the showcase in an official capacity of sorts. I was called upon to do screening reports for both showings of Soul Surfer. The first screening at 11am was a private ‘cast & crew’ screening to give those who worked on the film an opportunity to see it for the first time. The second screening was the public showing for the showcase. Having already seen the film once three days earlier, it definitely made watching the crowd easier as I knew when to expect audience reactions. However, seeing multiple screenings of a film within a short amount of time isn’t the most fun experience in the world, in fact in some ways I do get tired of seeing the same film multiple times. Other Thoughts . . .
Getting to Know People :: So back in October I worked HIFF as a volunteer for the first time. Being that it was my first time I didn’t quite know what to expect both in the sense of job duties as well as of the people I would be working with. Showing up to volunteer on Friday night, I recognized the familiar faces that I had met in the fall. In fact, I even recognized familiar face from many falls ago . . . someone that I went to school on the mainland with. Yeah, come to find out we had both worked in the fall and had not even run across each other (which is easier than you think). It was good talking to her and finding out what happened with our lives since the mainland. Of course a few of the usual suspects were volunteering again. I have to say though, this time around I got to talk with some of them a bit more and after doing so, I definitely began seeing them in a different light. Nothing about my overall opinions really changed about them, however I did get a better understanding of who they were and where they were coming from. You may never get a second chance to make a first impression, but you can definitely continue to make positive impressions that help others to understand. Pulling Back the Curtain :: Now, when we started doing this blog a little over two years ago I wasn’t really expecting all that much to come out of it (and in many ways nothing has). You know, I post it to my Facebook and tweet it out so that maybe a couple people outside of family and friends would read it. Nothing major. We’re doing it cause it’s fun and we’re into movies. Having said that, anytime someone I don’t really know posts a comment, retweets something I put out, or even mentions that they read the blog . . . I’m really appreciative of that.